This recipe is adapted from 1957's [%amazonProductLink "The Gourmet Cookbook, Vol. 2" asin=B000J30NV4]. It’s less sweet than the original and also, I’m sorry to say, less inebriating, with about a third of the original's alcohol. It still packs a punch, though; perhaps people started training earlier for eggnog season back then. This is a party-sized batch; I often make a half-recipe, which still serves 6 to 10 people. In a large bowl, beat the egg yolks until light. While still beating, gradually add the sugar. Continue to beat until the yolks become thick and light colored. Whip in the half-and-half, then slowly add the bourbon and brandy, still beating. Transfer to a punch bowl, preferably set on a bowl of ice (I usually skip this step — we drink it fast!). In a clean bowl, whip the egg whites until they hold stiff peaks. Take about ¼ of the beaten egg whites and whisk them lightly into the egg-yolk mixture. Fold in the remaining whites, leaving snowy mounds on top. Sprinkle the rum over the egg whites, and grate nutmeg on top. 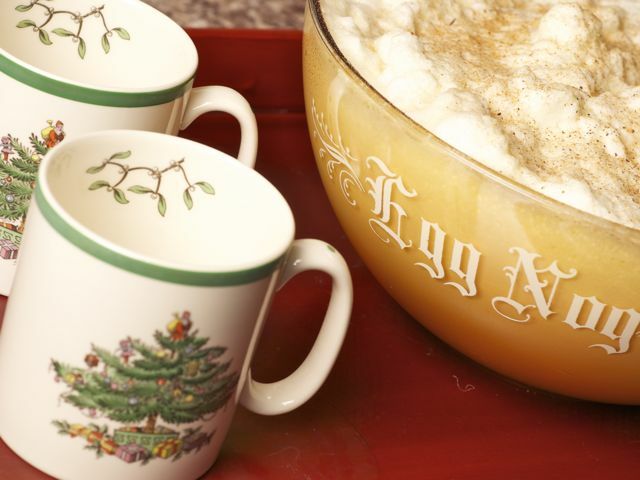 Serve the eggnog in glasses or punch cups. Have the nutmeg and grater available for people to add as much as they like. Some preferences: I like Maker’s Mark bourbon. Also, avoid ultra-pasteurized half-and-half. It has an unpleasant cooked taste, and has no place in your eggnog bowl (or anywhere else). And be sure to grate your nutmeg yourself. It's more flavorful, and the little nutmeg graters shine like Christmas ornaments.